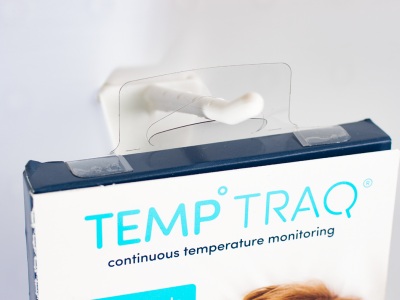 Do-It Corporation designed the R-KJN hang tab for Blue Spark to help simplify their TempTraq® packaging. The new R-KJN tab provides a sturdy slot for hanging and also folds across the top—sealing the box. The slotted fifth panel and the two seals needed to secure the old box top were eliminated. Do-It’s heavy duty, tamper resistant R-UCD security tab seals the bottom of the box. Both the R-UCD and the R-KJN are clear, allowing all areas of the package to remain visible.